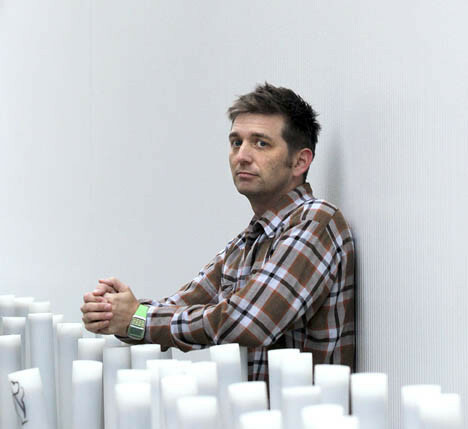 John K. Samson sets out across the continent for his first solo tour this week. Photo Jason Halstead. Though he’s been in the Canadian music scene since the late ‘80s, this week marks a first for John K. Samson: it’s the first time The Weakerthans frontman will tour with his name on the marquee. He’s crossing the continent in support of his new solo LP Provincial, a record that started out as a series of seven-inch demos about stretches of road in Manitoba. The demos soon took on a life of their own, tied together by the strange self-published history of a forgotten sanatorium in Ninette, MB. Samson uncovered the stories at the library in his home town of Winnipeg, where he’d been writing more and more as his years with The Weakerthans went on. On Provincial, Samson takes this research-heavy writing even further, travelling to small towns in the province to hear the stories of the people who live there, transcribing memories and weaving them into folk-rock frames with the care and intimacy he’s become known for. He reaches in by telling histories, lifting important places from our past; he appeals to nostalgia, adventure and solace throughout the record. But while this may sound just like the formula for a great Weakerthans record, his fellow members are nowhere to be heard on this LP. Samson pieced together demos from the last two years and re-recorded them for Provincial last April, arranged with the help of producer Paul Aucoin. The resulting work finds slow, strings-and-piano-backed songs alongside the up-tempo rockers and acoustic ballads. There’s nothing radically new, but there’s growth here—and it is definitely his most pensive record to date. For those itching for a new Weakerthans record, Provincial isn’t that far off. But fans shouldn’t fear—once this tour wraps up he’ll be back with the band, where he still finds great comfort and inspiration. “There’s some kind of strange math going on,” he laughs, in reference to the increasing number of years between Weakerthans records. “I don’t think that’s going to change, it might get even slower as we get older and all have different interests in different things in our lives. “Often the music acts as a hook to hang the words on and I’ve always been grateful for that as a writer,” said Samson. “I think I’ve always been a thwarted short story and poetry writer; both of those things seem forebodingly difficult to me because that structure isn’t there. Samson played bass in Manitoban political punk band Propagandhi in the early ‘90s before leaving to pursue work in publishing, and soon after combined his love of music and poetry with The Weakerthans. While it’s been more than two decades since his anarcho-vegan days on the four-string—and while the bpm is markedly lower now—he still has a lot to say. “[With Provincial] I’d like people to recognize themselves and the place that they’re from. It’s the thing that we all have in common, that we’re all from somewhere. Those places are all both universal and unique, and those unique things about a place are really important; I think they allow us to relate to other places,” said Samson.